From the copy of the House and Senate Democratic bill passed by a vote of 232-190 today. The US House of Representatives just passed the Save the Internet Act of 2019 on a vote of 232-190. The bill will now be in the hands of the Senate, where Republican leaders have already warned it is "dead on arrival." The other roadblock facing the bill is President Trump. Ella Nilsen reporting in Vox: "Trump has said he will veto the bill should it make it to his desk. Senate Majority Leader Mitch McConnell called the bill 'dead on arrival in the Senate' and will likely decline to bring the legislation up for a vote as a result." 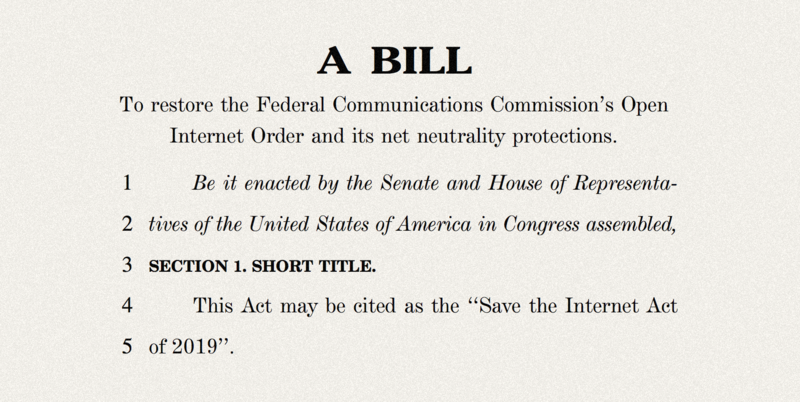 — The bill Democrats passed in the House today, the "Save the Internet Act of 2019," is a three-page long effort to undo the FCC's 2018 repeal of net neutrality rules. It also aims to embed the rules into law, making it difficult for a future FCC chair to undo them. — "This bill should not and will not become law," says Ajit Pai, the chairman of the FCC, in a statement after the bill's passage today. "This legislation is a big-government solution in search of a problem. The Internet is free and open, while faster broadband is being deployed across America." Local Time: Tuesday, April 23, 2019 07:25 AM PDT – Page Load: 0.5313 Sec.